This VOR approach requires two course changes and two separate descents; it's not an especially difficult one, but things happen quickly enough to present you with a challenge. You'll depart via Runway 19 at El Monte. After takeoff, you'll toggle the NAV-1 omni bearing to center the needle, then track inbound to the Los Angeles VOR. About 5 miles DME before station passage at Los Angeles, you'll set the airplane up for the approach. The VOR is on the field at Los Angeles International Airport. As you come in over the station you'll turn left to heading 136°, then track outbound on R-136. At that point you'll also begin an initial descent to 1200 feet. NAV-2 will be set to Seal Beach R-268, as a reference for Laske Intersection, which is 5.8 miles DME from the VOR. You'll maintain 1200 feet to Laske, and then will resume the descent to Torrence. Your decision point is 8.2 miles DME from the Los Angeles VOR. The approach is outlined in Figure 4-4, and the published plate for this approach is provided in Chapter 5. Study the plate before departure. Departure. We're at El Monte, 22 miles northeast of Los Angeles. Depart on Runway 19 and climb out from the airport on the runway heading. Homing on the Los Angeles VOR. 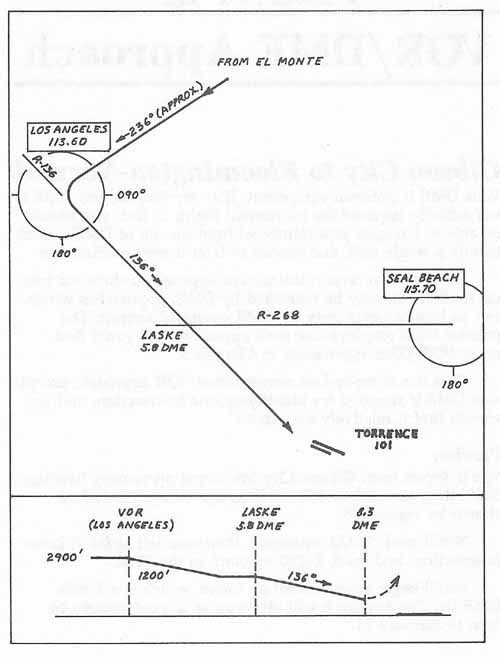 After establishing a 500fpm climb, toggle the NAV-1 omni bearing to center the needle; note the resulting radial; then turn to that heading and track inbound to the Los Angeles VOR. Level off at 2900 feet. Setting Up for the Approach. Five miles DME from Los Angeles, slow down and get set up with 10° flaps. Station Passsage and Outbound Turn. When set up for the approach, with the NAV-1 needle centered, toggle the NAV-1 omni bearing to 136° for the radial we'll be tracking outbound. About 1 mile DME before station passage, begin a left turn to 136°. Intercept the 136° radial, center the needle, and begin tracking outbound. Initial Descent. As soon as you're established on R-136, throttle back and begin a 500fpm descent to 1200 feet. Go to the Edit Page now, and set up some cloud cover if you wish. Try TOPS at 1000 and BOTTOMS at 800 feet. Laske Intersection. You'll be at Laske when the NAV-2 needle centers and you're 5.8 miles DME out of Los Angeles. Maintain 1200 feet until you reach Laske; at Laske resume the descent. Landing. Your decision point is 8.2 miles DME from the Los Angeles VOR. If you have the runway at that point, turn left slightly and land in the usual manner.